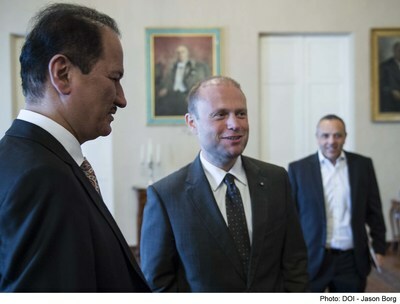 DUBAI, UAE: PRNewswire: DAMAC International Chairman, Hussain Sajwani, sees Malta as a favourable investment destination, following a tour of the island-nation and a private meeting with Maltese Prime Minister Dr. Joseph Muscat. The two discussed the increasing growth of tourism in the EU-member country and Malta’shistorical appeal as business-friendly investment location. DAMAC gained international recognition for its strategic partnership with the Trump Organization, where the two partnered to develop the first and only Trump International Golf Club in the Middle East. It has also enjoyed international success the launch of its 50-storey AYKON London One residential development in the United Kingdom, which has already pre-sold over 45 per cent. AYKON London One is set to become one of London’s most prestigious addresses and the first in Europe to be designed in partnership with Versace Home. DAMAC has delivered more than 18,500 homes and has over 44,000 units in various stages of development. The Company’s footprint extends across the Middle East with major projects in the UAE, Saudi Arabia, Qatar, Jordan, Lebanon, United Kingdom and Oman. DAMAC Properties has been at the forefront of the Middle East‘s luxury real estate market since 2002 – bringing luxury living experiences to residents from all over the world. Making its mark at the highest end of stylish living, DAMAC Properties has cemented its place as the leading luxury developer in the region, offering iconic design and the upmost quality. The company’s footprint now extends across the Middle East with projects in the UAE, Saudi Arabia, Qatar, Jordan, Lebanon and the United Kingdom.